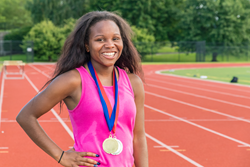 Milton Hershey School sophomore Tatyana Gibson recently earned a gold medal in the 15-16 year old girls 2,000-meter steeplechase at the National Amateur Athletic Union (AAU) Junior Olympic Games at Eastern Michigan University. Tatyana secured her national championship title with a time of 7:51.67. It was only the third time she ever competed in the steeplechase. A resident of Harrisburg, Pennsylvania, Tatyana enrolled at MHS in fourth grade. She has participated in track and field at the school since seventh grade. During the 2016-17 season, she led the MHS varsity track and field team in points scored as a freshman. In addition to Tatyana’s first-place finish, MHS seniors Treyvon Ferguson and Jordan Winslow also competed in the games. Treyvon earned a sixth-place medal in the triple jump and Jordan finished ninth in the high jump. The trio qualified for Junior Olympics after their stellar performances at the 2017 AAU Region 2 National Qualifier Track and Field Championship in New Jersey in June. Milton Hershey School provides more than 2,000 students with an excellent education and a wide variety of extracurricular activities, including athletics, visual and performing arts, scouting, and more, all at no cost to their families. The school’s athletic opportunities help students find their interests and commit to their passions. They also learn how to build lifelong friendships and cooperate with a team that works toward a common goal. Coaches motivate athletes, encourage positive attitudes, and help them balance academics and sports. Find more information about Milton Hershey School’s extracurricular and athletic programming at mhskids.org.